Posted: Sat Aug 24, 2013 2:13 pm Post subject: Kayak Fishing Tourney September 22nd? I have a question.Is this going to be a STRICTLY BASS tournament?Or will there be other categories that will be included for largest fish?I only ask because there are trout and walleye in there as well.1 prize awarded for largest trout..1 for walleye.Besides largest bass and bag limit.Was just wondering.Have 3 boxes and drop an unopened trout,walleye and bass lure in each one.Winner of each category gets the box.If no walleye are caught then the box gets divided between the trout and bass winners.Same goes for if no trout are caught.If neither for some reason then the bass winner makes out like a bandit or they can be awarded to a second and third place winner.Just a thought for others that aren't big bass fishermen.It may increase the turnout.If someone has largest trout AND bass they can only win one (their choice. )Giving others a chance at winning something. 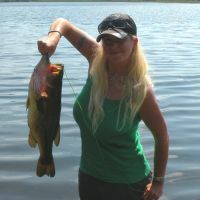 for now it is only bass, as the turn out gets bigger for tournaments that I may do that. Last one we had a lunker pool that was a cash pool which was optional, and a first place pool which was a bag of unopened tackle as well as trophies for 1,2,3 the main focus is to get together and have fun and do some fishing. Great ideas though thank you. We did toss the idea around the last one and considered targeting other species after all the Pickerel that were caught. Like i said,just a suggestion.I figured it may draw in more members.As long as it's a fun day.As long as nothing important comes up i may make my first appearance at one of these.I could always head over to the Lieutenant river afterwards to try for stripers. One more question.Is it strictly use of lures? Even a trout tourney to change things up at some point???? I prefer simple, although I'd be thrilled to catch a walleye at Rogers. Hope you can make it and yes lures only. I am in with my non-regulation vessel and please make sure to get the same trophies as last time. Not sure if i have to work that day yet. I'm only a pencil in at the moment,until i know for sure. Awe.....no bait.DARN! Ha.ha.ha Guess i can't make use of the abundance of pond shiners there! Perhaps there will be a trout tournament in the future. 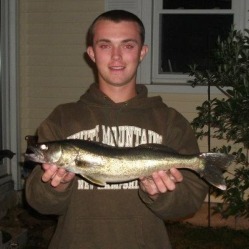 I say lets have a trout tourney on West Hill pond! 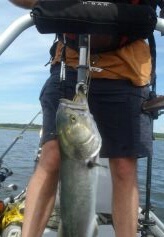 I think that Alan's getting sumo wrestlers on the next bass tourney trophies, instead of trout. Yeah.I'm on the outer loop of that joke.i didn't know there was a goof on the trophies last time. JJay you are right there is another thread here I have you counted in. Avidangler no worries I have you as a maybe, would love to have you come out if you can. So far 12 committed and 1 maybe. Okay no for the trophy story: I go to the local trophy shop (mom and pop or daughter) type shop. Pop is on vacation and daughter is running the place. Tell her what I want and point to the bass I want on the top and the date. Well I leave and never look at the paperwork until I get ready to go back to pick them up and to my surprise I see the date is wrong. The date on the trophies had already past before I even picked them up. Well I think no big deal. Look further down on the paper work and see the word trout and I'm like hmmm typo. I pick you the trophies and what do I see, but a trout on top so LUCY had some explaining to do at the tourney. So I think I should now just pick random tops for the trophies to keep with tradition. Okay side note for the tourney how do you lady (KIra) and gents feel about a team format picked at random. Let me know.